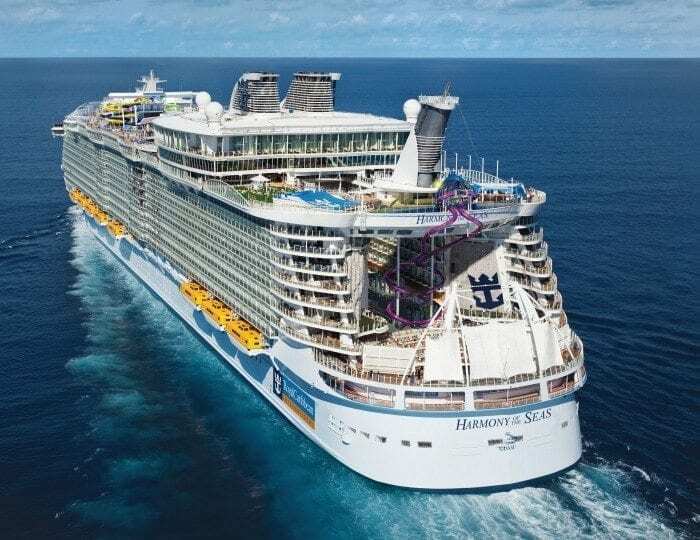 Harmony of the Seas – May 2016. Royal Caribbean Ultimate Abyss to be the tallest water slide at sea. As the line from the movie goes, “If you build it, they will come”. That’s exactly what Royal Caribbean is about to do. When the Harmony of the Seas debuts in May 2016, the new ship will have bragging rights with their Ultimate Abyss 10-story water slide. Water slide daredevils will love this one. A staggering 150 feet above the ocean, the Ultimate Abyss will be located at the aft of the ship overlooking the AquaTheater. Built as two side-by-side tubular slides, riders will drop 100-feet from Deck 16 to Deck 6. At speeds up to 9 miles per hour, the dual slides extend from the Pool and Sports Zone all the way down to the festive Boardwalk deck. See the skinny purple tubes? That’s it! Ultimate Abyss thrill-seekers begin the ride from a glass platform that affords a view of the Boardwalk below them. While sitting on a customized mat, riders shoot into the tunnel-like slides and the adrenaline rush kicks in. Each tunnel is equipped with audio effects to create a multi-sensory experience. Riders plunge through 216 feet of stainless steel tubes, a mere 2’6″ in diameter. Claustrophobes need not apply. If you’re not quite ready for the Ultimate Abyss or a tad too young, there will also be the Perfect Storm trio of water slides and Splashaway Bay interactive aqua park for kids. Personally, I’ll have just as much fun observing the Ultimate Abyss from deck 6 looking up as those who dare to take the 216-foot plunge.